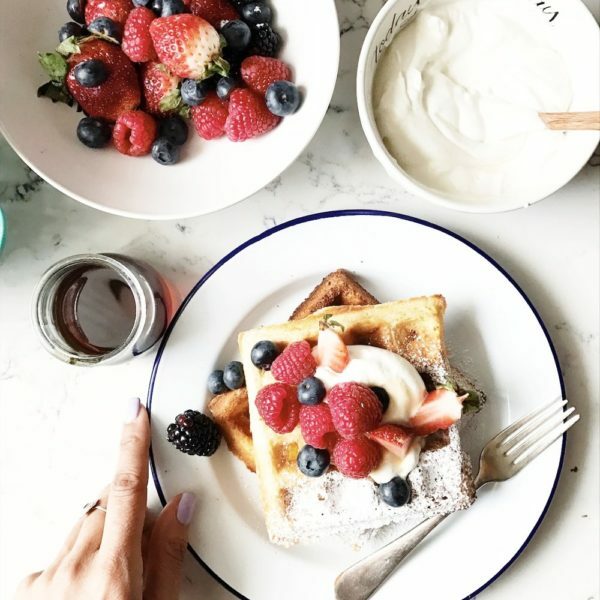 If you’ve been following me on Instagram for a while, you’ve noticed that waffles for brunch is how we start our Sundays. I started making them part of our weekends when Gaby was just a toddler. Since then, we lived for a year in Dominican Republic, and for 3 years in Mexico, so waffles on Sundays became a way of keeping this sweet tradition as a constant on my girls lives while living abroad. Back home in Canada, Sunday mornings begin with a very needed latte (while still in my pjs because cmon, aren’t mornings in pjs the best?!) I usually get on the phone with my mom, and once coffee is done, I start whipping up a batch of waffles while listening to Bon Iver or Arcade fire. Gaby gets up just in time to help me measure, mix ingredients and get the berries ready. 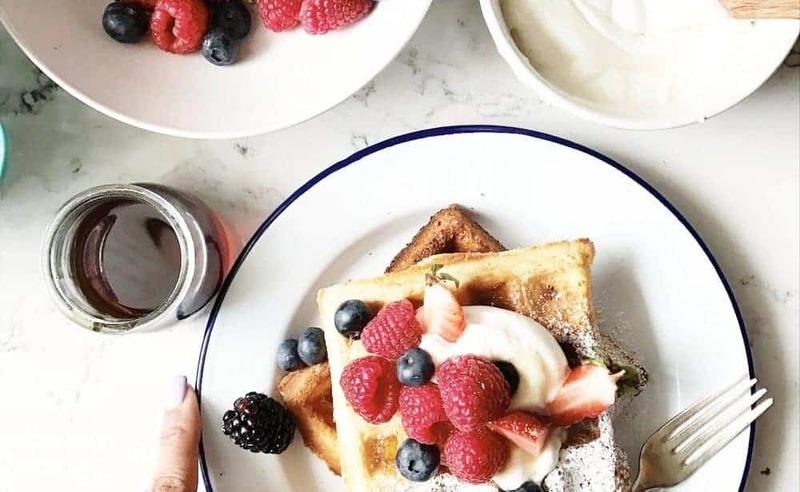 As I ladle scoops of batter into the waffle iron, the smell of vanilla fills the air, and while I sip on my second latte, I can’t help to feel so very grateful to have Sundays like these. 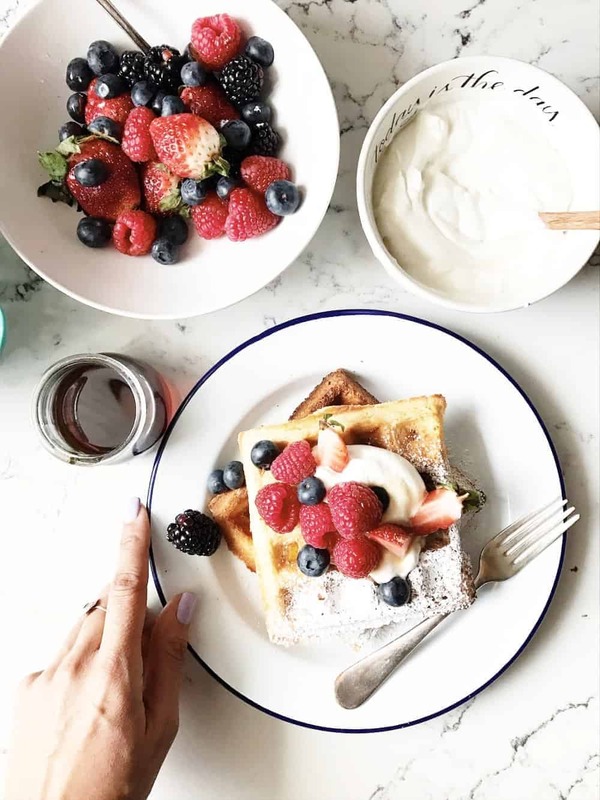 Where there’s no rush to get on with our day, that we can linger in our pjs, and enjoy brunch while we talk about our plans for the week to follow, and top our waffles with maple vanilla whipped cream & berries. 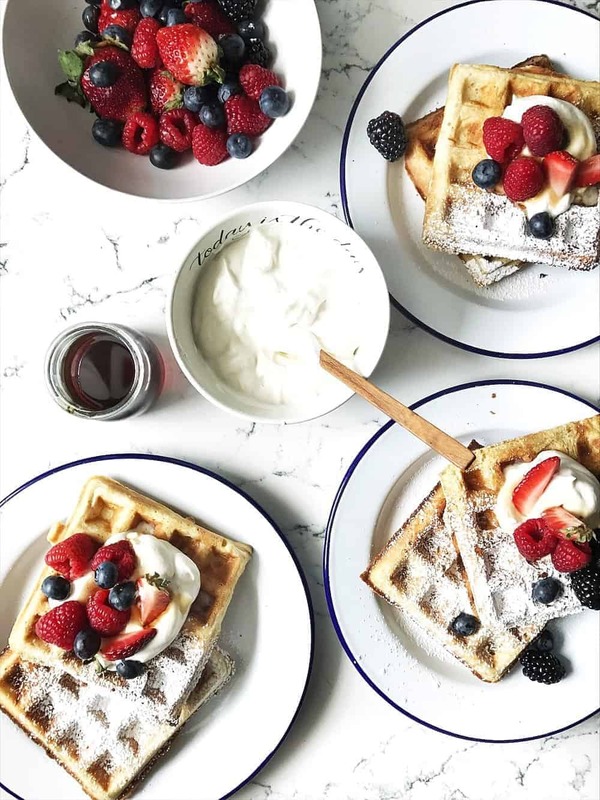 Sunday waffles means more than having a meal together…it’s a tradition started out of love, and giving my girls Sundays to remember. 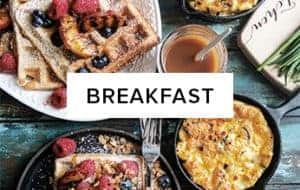 I hope that one day, if they decide to have a family, they make Sunday waffles a part of their lives, and I’m sharing this recipe with you, so you can make it a part of your weekends too. 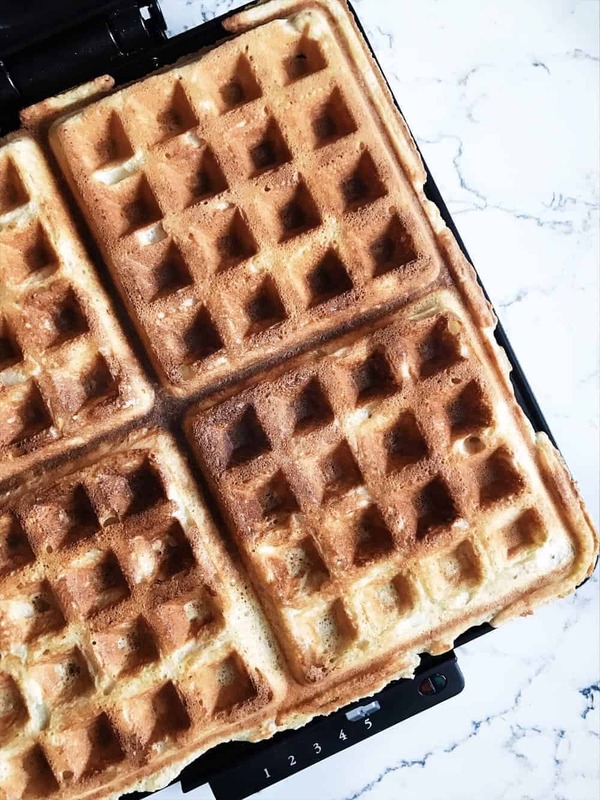 What I love the most about this recipe is how light the waffles turn out, because let’s be real, waffles that are dense and heavy, can leave you feeling sluggish for the rest of the day. The trick with this recipe, is to add whipped egg whites to the batter. 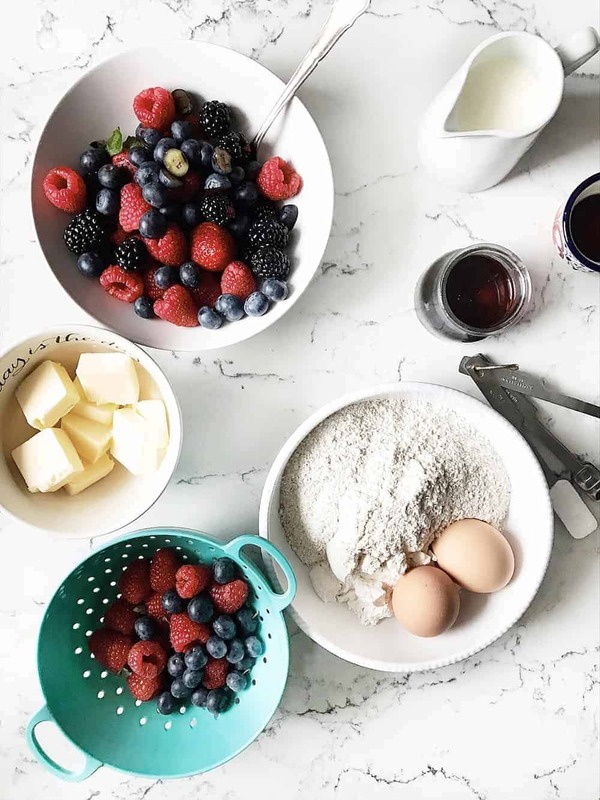 This step guarantees that they’ll turn out light as air and ready to be topped with your favourite fruits, whipped cream or my personal favourite, coconut yogurt. Sunday waffles are also great for hosting a brunch with friends and family. I love having my close friends over and add a couple of frittatas to our oven, plus set a few glasses mango mimosas too. Now, that’s Sunday Funday! There are many variations to this waffle batter. 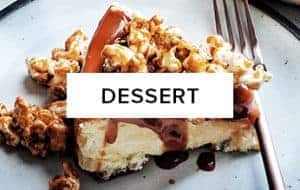 You can add poppy seeds and lemon rind, and once your waffles are ready, top them with lemon curd and raspberries, or you can also add mashed bananas to your waffle batter and top them with caramelized bananas and pecans. The ideas are endless and your Sunday will start in the best way. I would love to hear about your waffle making! 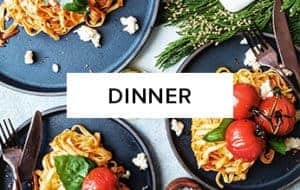 Leave a comment below or tag #dialaskitchenwaffles on instagram. Preheat the waffle iron. 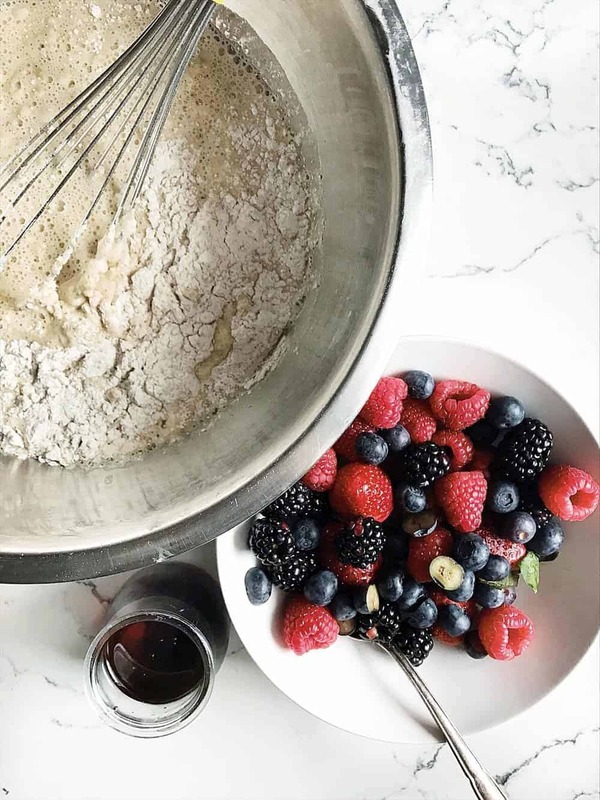 Set the berries aside. 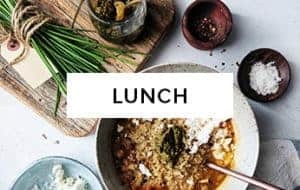 Whisk the milk, egg yolks, vanilla and melted butter together in a large mixing bowl, then stir the flour, sugar, baking soda and pinch of salt, working the batter until smooth. Whip the egg whites with a whisk or handheld mixer until they hold a stiff peak. With a rubber spatula, fold half of the whites into the batter, then fold in the remaining half. 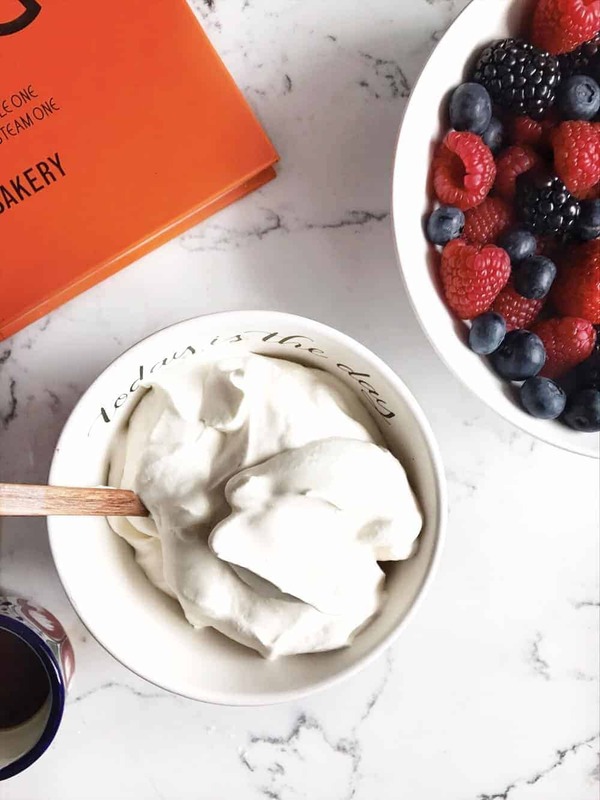 To make the maple vanilla whipped cream, whip all its ingredients in a stand mixer until soft peaks form and once ready, place it in a medium bowl. Open the waffle iron and brush both sides with a thin coat of melted butter, even if it’s nonstick. Add a ladleful of batter to the preheated waffle iron ( this will depend on your waffle iron) and spread evenly. Close it and cook waffles until crisp, about 4 minutes per batch. I own a Cuisinart waffle iron, and usually let them in until the light turns green twice. Serve waffles topped with a dollop (or two!) of maple vanilla whipped cream, berries and maple syrup. I dust mine with a bit of icing sugar too. Enjoy them in your pj’s and with the people you love.